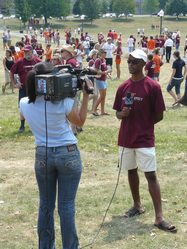 After the intermediate memorial dedication ceremony, interviews such as this one were commonplace. 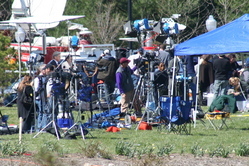 But while there was clearly a media presence at this event, it was subdued in comparison to the immediate aftermath of April 16. Haiyan Cheng,who experienced the shooting with her students in the Norris Hall on April 16 was talking with the journalist. An reporter pauses, thinking, while talking with a Tech student.